Today we are lucky to have Polly here from the blog, Aunt Polly's Porch. so I can share some photos here that didn’t make the final cut there! 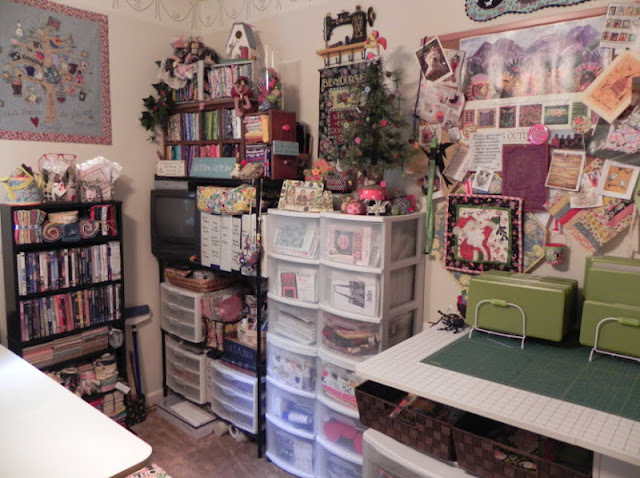 I will admit it - I am an organization freak…and that’s a good thing when you have as much sewing and quilting stuff as I do in a room that is 10’ by 12’ in size! I am lucky to have a nice wall-to-wall closet in the room, to house my rather large stash. I use grey metal shelves in the closet for stacking/sorting my fabrics. 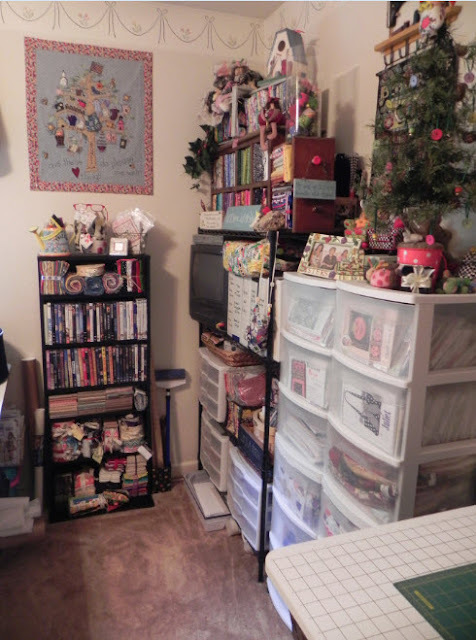 I have a nice bookshelf I bought at Target with all my quilting and sewing books and notebooks from classes, as well as, sewing machine manuals. But I really love the white plastic rolling chests of drawers for storage that are available in so many sizes and shapes and are so reasonably priced at local stores. 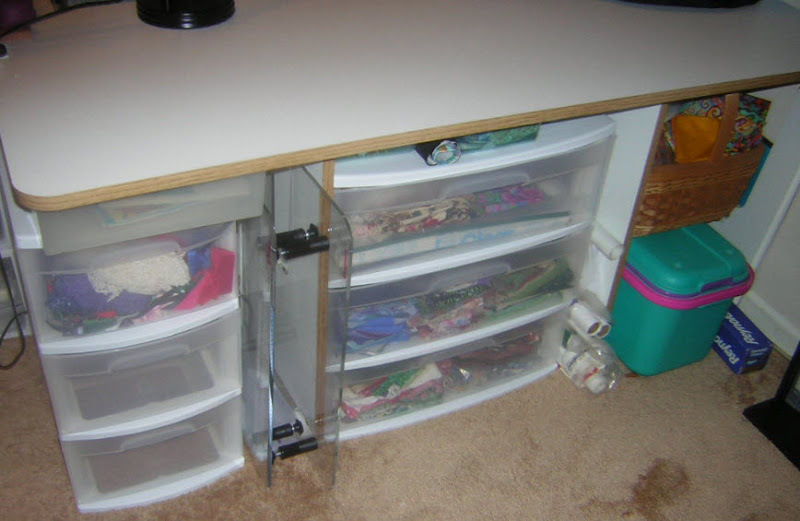 I have this set right next to me with all my sewing machine feet, threads, notions, buttons and other supplies within close reach! 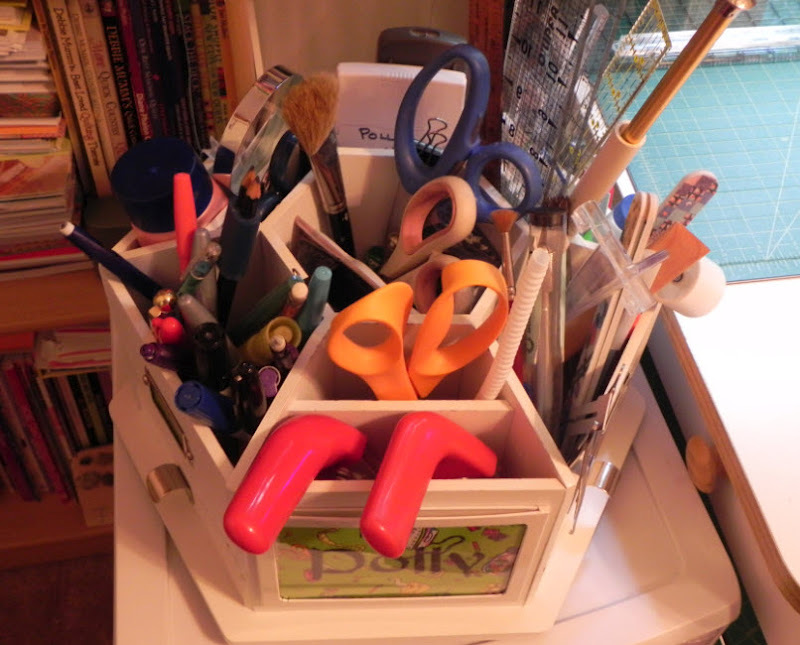 I use this double tall stack of drawers for organizing my many patterns, buttons, stabilizers,and embroidery supplies. Next to those tall stacked drawers is a black metal shelf with my TV/DVD on it and I also have 3 little sets of white plastic drawers on those shelves, as well!! These two sets of drawers fit nicely under the sewing table extension and house organized scraps and other bundles of coordinating fabrics. This awesome round wooden revolving organizer is actually made for scrapbookers, but is also perfect for us sewers with lots of drawers and sections for keeping our many tools organized and close by! I bought it at Michael’s with a coupon! Woo hoo! This little black shelf unit was made for media storage and I actually do have two shelves on it loaded with my sewing room chick flicks! 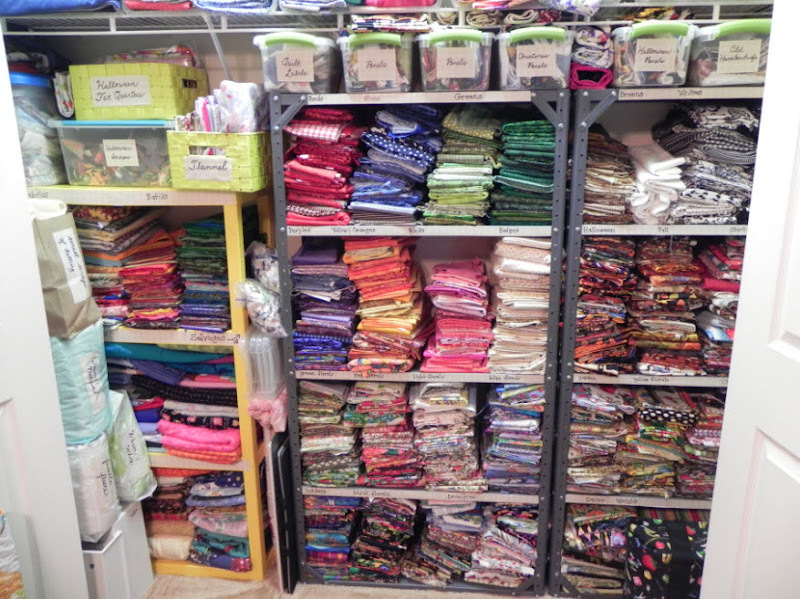 But the rest of the shelves are just perfect for storing pre-cuts like charm packs, jelly rolls, FQ bundles and such! And this antique wooden cabinet used to have drawers in it, but I removed them so I could use the resulting cubbies to store my fat quarters! My thread is stored here on the wall using two June Taylor thread racks from Joann’s. The white cutting table with drawers below, was also bought at my local Joann’s using a coupon. I store my quilting rulers in standing racks on top of it on the right against the wall with my design area. Next to them are all my green Accuquilt GO! dies in racks, too. Above these is a bulletin board for displaying photos, articles and other ideas collected for inspiration!! I also have a sewing companion…my little Westie named Yogi! He has his own bed on top of my sewing table next to the window. When he’s not lulled to sleep by the hum of my sewing machine, he will be watching the squirrels scamper around below on the deck! What a life!! Please come visit us soon at Aunt Polly’s Porch! Thank you so much, Polly, for stopping by! 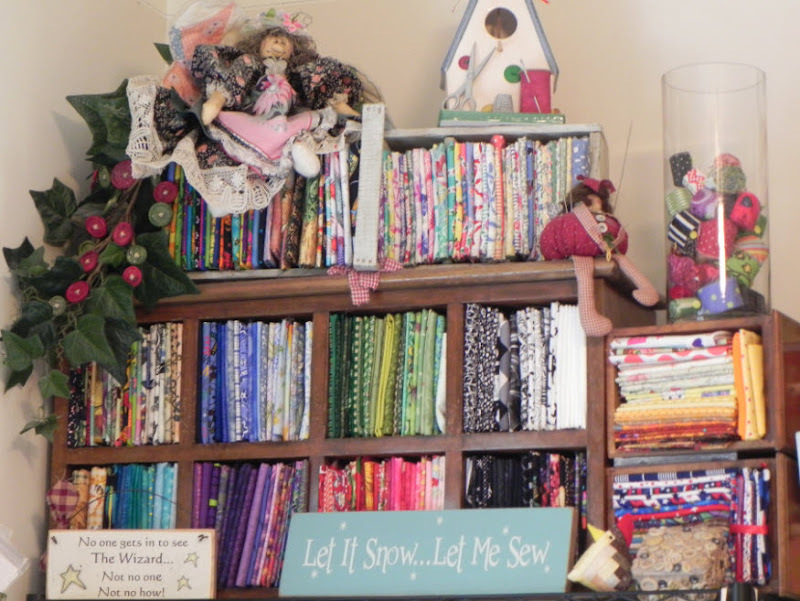 What a treat it was to see your fabulous sewing room. I think we all can take a lesson from you on organizing! P.S. I love your display of spools of thread and how you have so many bobbins organized and ready to go! Please feel free to leave Polly some comment love below! Oh my God! This is just a dream, not a workshop, I have no words to describe this beautiful, incredibly nice and cozy))) and how much is all sorts of useful accessories for needlework, just wow! I can't believe all the things you have in there...and the thread looks like a rainbow also the bobbins...what a fabric stash..going to use some of your ideas...Thanks for the tour.. Pretty sure I'd get distracted looking at that thread rack and never get any sewing done! WOW! I'd love to have a sewing room that was sooo organized, but then again I might get scared to see how many tops I have to quilt. What a wonderful space for sewing and creating! Thanks for sharing! I love it! and I really love the antique machine on the wall, holding the quilt...you did an amazing job organizing everything...sooooo pleasant to look at. 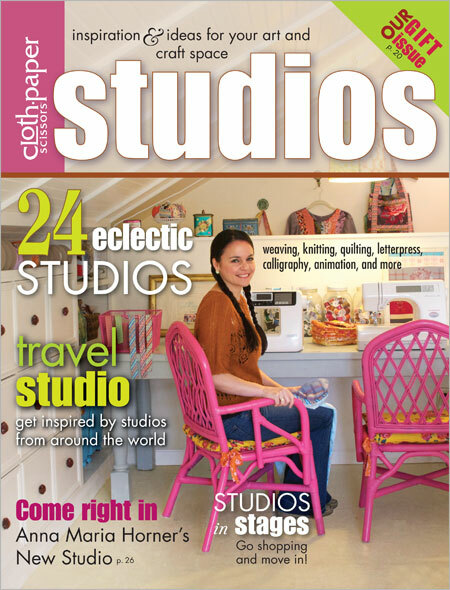 I want a craft studio just like this one! My mouth is watering looking at those photos. I bet you get very creative once you step into your studio in the morning. Thank you for sharing your creative world with us! My space is not much smaller than this but has a ways to go to be as organized. You have inspired me to go upstairs and get my organizing "mojo" on. I'm actually not THAT bad but with a few hints from you I could have a much better sewing cave. I can't have Yogi though and I do think he is the crown jewel in your room. How old is Yogi? What a great quilt room and wonderful use of space! Yogi is such a great addition too! What an awesome room!!! I love seeing how other people organize and arrange their rooms so I can get ideas for mine! Thanks for the post! I love to have my room clean and organized but--- I find that I don't want to mess it up. It looks so nice and I thought that this Christmas I'd get so much done, but it didn't snow! Other half had cataract surgery on both eyes and I just haven't accomplished anything!! !Shame on me! It shows in my attitude which is not nice if I can't be left alone and allowed to just sew and not wait on one two legged man and two furry four legged barkers. Have to get busy! wow. u made me vell jell! omg, i don't even own 1/4 of that stash! lol. beautiful girl! What a great sewing space & so organzied. Love it! 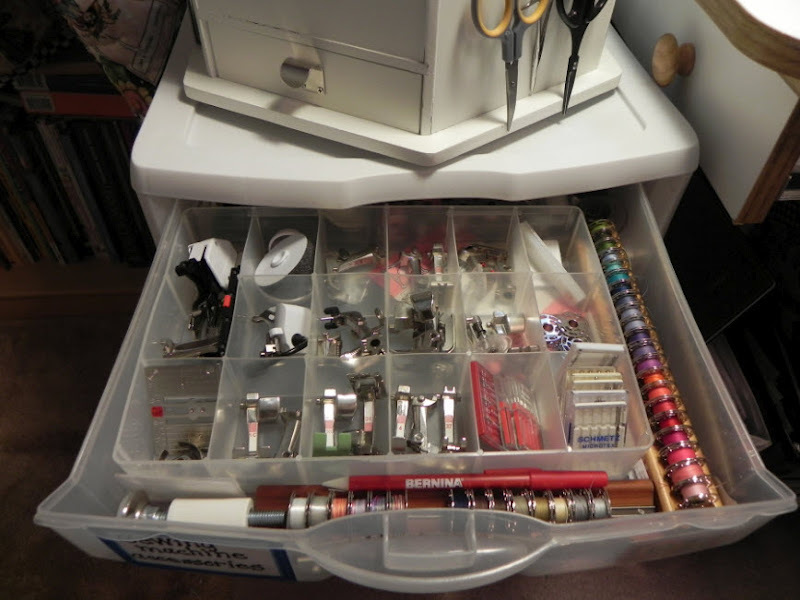 What a treat to tour your sewing room and see all your organizational tricks - I love the bobbins in one of the drawers. And, of course, you saved the best for last - your little Yogi - adorable! All I can say is...WOW!!!! Your room is AMAZING!!! And Yogi is soooooo sweet!!!! LOVE your "quilt it" small wall quilt too!!!! Thanks for sharing!!! Polly, you've come a long way since we were neighbors! I am so happy for you. I still have the many items that you made for us.